Though I thought I would miss them living here in Paris, I have found burgers all over this city. Expecting a weird french version of the American classic, le cheeseburger, or simply le cheese, can be pretty damn good. Hefty patties of rare, deep-red, french beef, minimal fixings (often just grilled onions and cheese), and a fluffy bun make for a fine burger. And they're not just for the Americans in town; everyone here seems to love le cheeseburger, and in their own special way. Danielle and I often marvel at the many consumption methods Parisians employ, almost exclusively with a knife and fork: we've seen people cut dainty bites and dab a little mustard and mayonnaise on each one; we've seen burgers deconstructed entirely and eaten in stages; and my favorite, one man cut his burger into quarters and ate each quarter in one bite, with a fork. Four bites. 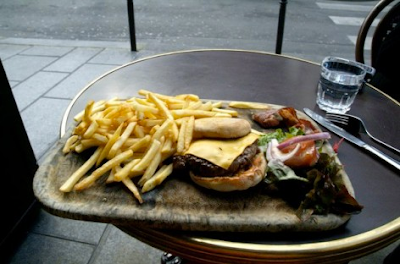 The French may be known for fine, delicate cuisine, but they also know how to simply grub down on a burger. And, contrary to what many Americans might think, it is totally okay to ask for ketchup. Here are my top three Paris burgers. So far, that is. This is the fancy burger, mostly because it costs €20 and it's across the street from the eponymous Louvre museum. But it also has a magical, meta-beefy flavor, almost as if the thick patty was infused with a beef stock reduction. The fries were delicious golden-brown, one-inch-tall cubes. I am curious to try the other things on the menu. Situated on a deeply tree-shaded lane, Café Crème offers three burger options. The Hamburger Buns is the standard burger on a bun (just one, contrary to the name) with great beef, good cheese, lettuce-tomato-onion, a slice of perfectly chewy, porky poitrine (bacon) and standard thin fries, served on a wood cutting board; next is the Hamburger Muffin, same as above, except with a slightly smaller patty, served on an english muffin; and lastly, the Hamburger Diet, same as the Hamburger Muffin, but served with a pile of sautéed veggies instead of fries, but I think you still get the bacon. French diet style. One time we asked for avocado instead of bacon and our waiter recoiled and said "Really? On a boorgoor?" I explained, "We're from California, we put avocado on everything, it's really good..." He cut me off as he walked away, "No no no, it's fine," and whispered, "I try it tomorrow." This classic Auvergnat brasserie is always packed, and serves burgers everyday except Saturday, which has always seemed weird to me because if there is any day of the week that is a burger, it's Saturday. But whatever. Their cheeseburger auvergnat is simple, french burger perfection: a sizable patty of excellent beef, onions, emmental cheese, served with classic bistro fries, a side salad, and a small ramekin of sauce maison, something akin to a creamy, shallot bearnaise sauce. They also serve good steaks, big dinner salads, and delicious desserts, my favorite of which is the Nutella Tiramisu, served in a flip-top glass jar. This is where the guy ate his burger in four bites. Me, I cut the thing in half and eat it with my hands, dipping each bite in the sauce, which, in French manner, lasts for exactly one burger. But as much le cheeseburger has charmed me, there is still a certain burger spirit that I miss from my homeland. And it has to do with one word: ranch. One, there is no ranch dressing here for the onion rings which are also missing. Two, the burgers are not cooked ranch-style, that is, flame-grilled. There is something intuitively, undeniably magnificent about fire and food. And ranch dressing, it's just delicious. I've had many in many places, but I think I've finally locked in my favorite California burger: Good Ol' Burgers in Paso Robles, CA. If you're ever driving on the 101 between San Francisco and Santa Barbara, or any towns on either side of this burger, I insist that you schedule a lunch stop here. It used to be just a shack on an unpopulated road that branches off the 101 toward the 1 and Hearst Castle. Now, a strip mall has popped up around it, and it has had a makeover that hints at franchise, but don't be deceived. This is the California ranch-style burger joint at its finest. 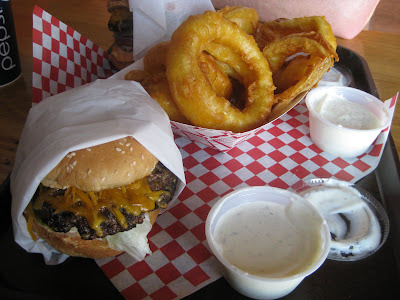 There is a small range of burgers, wraps, salads, dogs, etc., but I just go for a Coyote Burger, Wagon Wheels (their onion rings), a side of ranch dressing, and a Pacifico. Yes, they serve Mexican beer. If you choose to sit in the back dining room, you'll see a large window, on the other side of which is the grill and behind that the rest of the kitchen. In my book, it is always a good sign if a restaurant isn't afraid to let you see your food being made. Click here for all you need to know about Good Ol' Burgers. Also, I couldn't talk about California burgers without mentioning In-N-Out. It is the classic drive-thru. They use all natural ingredients and they've kept the menu the same since the fifties, at least the written one. If you've been to one, you know about the secret menu. If you haven't, you should go and find out. In-N-Out. And just to balance it out with my three Paris burger recommendations, my third California burger pick is my hometown favorite, The Hamburger Habit of Goleta, Santa Barbara, and Ventura. Great all around for burgers and other things. I'm not ashamed to admit that I usually order the Teriyaki Chicken Sandwich and, of course, onion rings. It's especially good if you are exhausted from surfing and you've had too many burritos in a row. The Habit. awh the habit, just brought me back! i went there during lunch for high school and ate mountains of french fries. Love all the juicy details! and the mention of the nutella tiramisu sweetly triggered my memory: the best dessert! Just wanted to stop by and thank you. I noticed you put a link to our business, Nour El Nil, on under your "ideas and resources" links. Much appreciated. How did you hear about us? Feel free to contact me.